NEW YORK (CNNMoney.com) -- The state attorneys general have been pressing the banks hard over the past month, questioning them over foreclosures and falsified legal paperwork. But Tuesday's election could impact that effort. 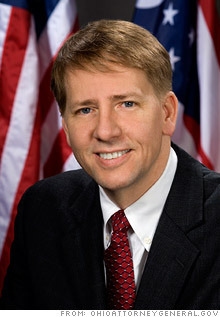 Ohio Attorney General Richard Cordray. Most prominent in that group is Ohio Attorney General Richard Cordray, who had filed suit against Ally Financial, alleging that the bank and its employees had signed and filed false affidavits in foreclosure cases, a practice commonly known as robo-signing. Cordray lost his reelection bid to Republican Mike DeWine, who has not yet declared whether he intends to pursue the issue. "After [Iowa Attorney General Tom Miller], Cordray was the single most visible attorney general in this effort," said Peter Swire, a law professor at Ohio State and former special assistant for economic policy at the White House. Despite the loss of Cordray and other AGs, Iowa Attorney General Tom Miller said the investigation will continue. "While some members of the multistate group, including a few executive committee members, will change political leadership in January, these changes do not affect the work we are now doing at the staff and leadership levels," Miller said in a statement. "This is a bipartisan and united effort with a clear mandate to put a stop to improper mortgage practices." Miller added that it is his job to conduct the investigation "methodically and quickly," but it is unclear how much the group can accomplish in the next two months with membership in flux and the new AGs trying to get briefed on all aspects of their new jobs. Cordray, however, expects the new group will continue moving forward. "It will change in the sense that new people will replace former people," Cordray said. "But I would be surprised if that changed anything material. We already had 50 [attorneys general] signed on across the aisle, and every last one merited it important." James Tierney, director of the National State Attorneys General Program at Columbia University, agrees. "It means nothing. AGs come and go all the time," Tierney said. "That's just the nature of the beast. ... If a new attorney general says 'I'd rather go after meth labs, and not foreclosures,' that's O.K." But it may make Miller's role more pronounced. "Miller will be a key decision maker. He has already been convening meetings with lenders," said Swire. "He is still in office, and with the other changes to the executive committee, he is the center of attention."